Product #48282 | SKU SC-DV7 | 0.0 (no ratings yet) Thanks for your rating! 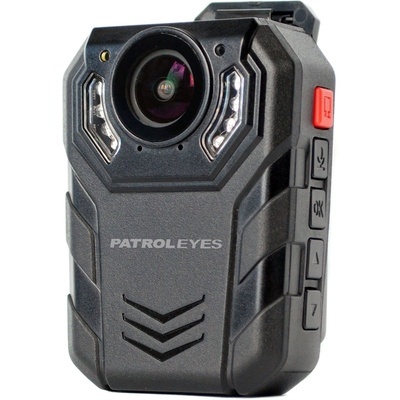 The SC-DV7 Ultra 1296p Body Camera with Night Vision from PatrolEyes can capture up to 2304 x 1296 video at up to 30 fps for smooth and clear playback. The swivel clips allow you to attach the camera to your clothes, backpack, or bag for continuous, hands-free recording. IR LEDs allow the camera to capture images in dark environments with its wide, 170° field of view. It can take still images at resolutions up to 32MP for high-quality photos. A 2" LCD screen provides quick access to video and photo playback, and lets you adjust settings on the go. Additional features include a built-in microphone and speaker to record and playback audio, as well as a laser pointer. The body camera comes with 64GB of internal storage to record video and photos. The 2650mAh battery provides up to 12 hours of standby power and up to 8 hours of continuous use. A drop-in charger, wall charger, and car charger are included to charge the body camera while at home or on the go.